Irish politics at the minute resembles a sort of intergenerational domestic feud. The Dail's relationship with the Seanad has deteriorated to the point where they can barely be civil to each other any more. The Seanad, indolent, under-achieving and coasting hopelessly, is being sent to a military academy by its emotionally distant, repressive and ultimately damaging and damaged guardian, the Dail. The 4th of October is the day when the people will decide if the Seanad should straighten up and fly off. In short the Senate, and the government's plans for it, is everything that's wrong with Ireland in an nutshell. But so is the Dail. Let's look closer at the Dail, in fact. Having launched headlong into a massive economic iceberg, Enda Kenny now says the Seanad could have done more to stop the financial crisis. He conveniently forgets the fact the Seanad aren't at liberty to much pertaining to money, and that the Dail went on a wanton solo run on the bank guarantee and much more besides anyway. 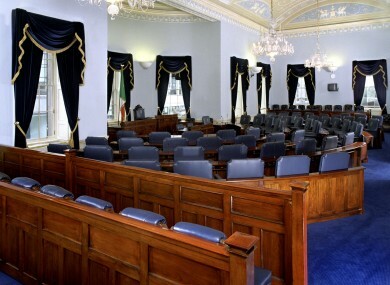 Displaying the same imagination with the Upper House as they have with pretty much everything else, this government is content to let the Seanad slide formally behind the bookshelf of governance, and it's too fat and lazy to reach in there and actually devise any proper use for it. Regina Doherty though, one half of the Keystone Cops running the referendum for the government, claims that abolishing the Seanad is in actual fact an exercise in leaner, meaner government. Everyone else is having to make do with less, she claims, so too must the political classes. Except, while they're cutting the Seanad down to the quick, they're only skimming 8 seats off themselves. A whole 5% cut! Meanwhile, the local authorities haven't been so much reformed as sloppily amalgamated, with the same old mandate to point at potholes in newspapers. We're getting to the point where the role of a TD will be that of a local councillor, national legislator, and their own check and balance. If their would-be assassins are ham-fisted and disingenuous in extremis, then the Seanad have been woefully inept at saving itself. In the last few days and weeks alone David Norris, clearly struggling with myriad legacy issues, has let his emotion get the better of him, his claim that Regina Doherty was "talking out her fanny" completely overwriting his earlier magnificent defence of the chamber he's sat in since 1987. Mary White invoked Godwin's Law comparing Richard Bruton to a Nazi propagandist. Jim Walsh was brutally graphic during the abortion debate. Terry Leyden suggested Hitler and Mussolini were good Christians. Fidelma Healy Eames.